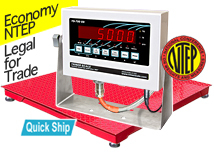 Shop industrial floor scale models, including square 4x4 floor scale packages in our quality 5000 lb floor scale selection for your drum, shipping and other industrial weighing needs. These self leveling industrial floor scales feature a diamond plate top, shock absorbing feet, as well as a mild steel junction box. Find superior floor scales from FloorScalesDirect.com, a division of the Triner Scale & Manufacturing Company, the standard for high capacity, adjustable floor scales for sale. All of these 4x4 floor scale packages arrive factory calibrated, ready to use with weighing deck, digital indicators and appropriate cords. 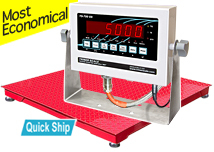 These 4x4 floor scales provide high accuracy measurements of 1 lb increment measurements up to 5000 lb on either LED or LCD displays. 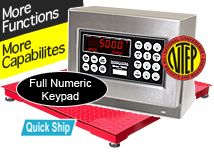 We also offer NTEP certified floor scales in our 4x4 floor scale selection as well. 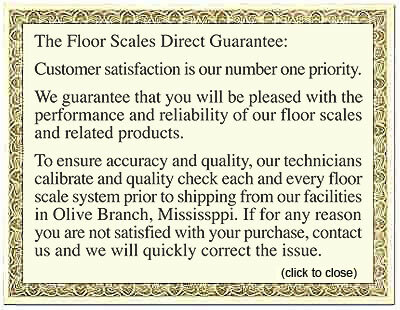 FloorScalesDirect.com manufacturers all of our 4x4 5000 lb floor scales and is able to provide free shipping within the USA to our customers. We also offer assistance by email or toll free by phone for help ordering, as well as tracking of all orders immediately upon shipment, in order to increase your shopping satisfaction. 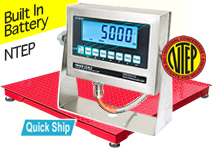 Shop 4x4 industrial floor scales for sale at Floor Scales Direct!